Movement: calibre BR-CAL.301. Automatic mechanical. Functions: hours, minutes, small seconds at 3 o'clock. Date. 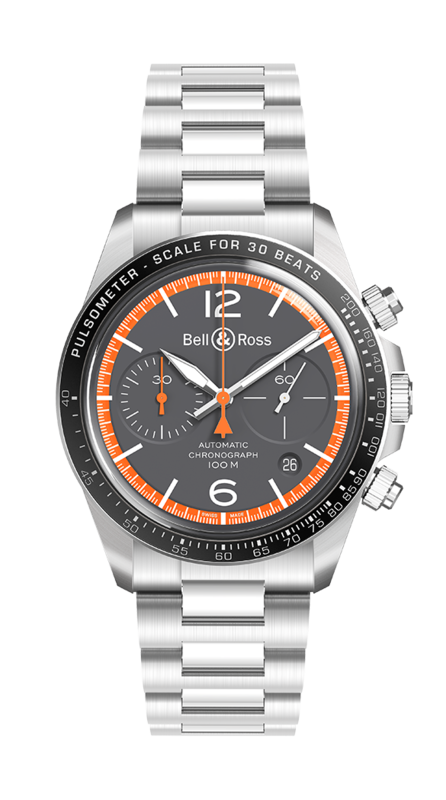 Chronograph: 30-min timer at 9 o'clock, central chronograph seconds. Case: 41 mm in diameter. Satin-polished steel. Steel bezel with anodised black aluminium ring and pulsometer scale. Screw-down crown and push-buttons. Sapphire case-back. Dial: matt grey. Numerals and indices coated in white Superluminova®. Metal skeletonised Superluminova®-filled hour and minute hands. Crystal: ultra-curved sapphire with anti-reflective coating. Strap: satin-polished steel or black rubber. Buckle: folding for metal bracelet. satin-polished steel pin for rubber strap.